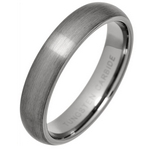 Our extensive range of scratch resistant tungsten carbide rings are available in a range of finishes, including our popular highly polished, or satin brushed finishes. 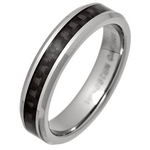 We also have tungsten rings with both coloured carbon fibre inlays, or sterling silver inlays. Tungsten carbide is a dense heavy metal, making it a great choice for men due to its durability, and scratch resistant properties. Our Tungsten Carbide Rings & Wedding Rings have been rated 10 out of 10 based upon more than 198 customer reviews.